domiciliary: a stable living environment with medical care and case management specifically created to help veterans. 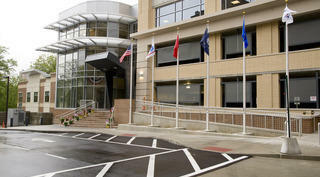 A state of the art residential care facility, the Veterans Domiciliary, located on the Wade Park Veterans Affairs Medical Center campus in Cleveland, combines rehabilitative clinical services with supportive case management services for homeless veterans. Based on the therapeutic community model, and in partnership with the U.S. Department of Veterans Affairs and the Louis Stokes Cleveland Veterans Affairs Medical Center (VAMC), we provide a range of rehabilitative care and support to foster veterans' functional independence and develop a mutual support network with fellow veterans. Designed as a safe, secure and unique residence for veterans, the Wade Park Domiciliary provides care to eligible male and female veterans who have a range of psychiatric, vocational, educational and social care needs. We offer 122 beds, with 14 beds set aside specifically for female veterans, and eligible veterans can receive services up to six months. Services provided include case management, vocational assessments and services, mental health assessments and services, substance abuse assessments and services, employment services, legal services, and recreational assessments and therapy. The Wade Park Domiciliary is accredited by the Commission on Accreditation for Rehabilitation Facilities (CARF).